How do I find this publication: Indiana Cemetery Locations, Volume 4, published by the Indiana Genealogical Society (April 2009)? I need information on the Riker Family Cemetery, Jefferson Co., IN. This cemetery is located in Shelby Township off Jefferson Road. I'm hoping for information on a Bible: Wireman Bible with births 1744 -1786. A Mrs. H.K. of Salem, Washington County, had the Bible in 1956. I am hoping the Indiana Genealogy Society has copied it. Thank you for any help concerning this Bible. My great-great-grandfather was a Civil War vet, wounded in Texas and died in 1880. I have been searching for years for a burial site and date of death with no luck. I have found records on Ancestry and Fold3, but nothing on dates or places. His second wife Adaline drew a pension and lived in Logansport, Cass County. She was the mother of my grandfather James Luther Cassel of Logansport. New Databases, Including Bartholomew, Jasper, Marion and Putnam Counties and More! Check out the latest databases available on the Indiana Genealogical Society website! - Directory of Hope and St. Louis Methodist Churches, Bartholomew County (1906). Contributed by the Yellow Trail Research Center, Hope, Indiana. Both of these databases were contributed by the Jasper County Historical Society. - History of the State Bank of Rensselear, Indiana (1904-1954). - Membership Directory of First Christian Church, Rensselaer (1958). - Enumeration of North Township Schools (1920). Contributed by Hammond Public Library. Each of these databases was contributed by the Genealogical Society of Marion County. Both of these databases were contributed by Wayne Klusman. - Graduates of Dublin High School (1875-1912). - Graduates of Economy High School (1889-1962). - Grand Army of the Republic's Annual Encampment in Indiana (1906). Contributed by the General Van Rensselaer Chapter, Daughters of the American Revolution. - Honor Roll of Indiana Veterans (1900-1999) -- in progress. Updated in November. - Members of American Legion Attending State Convention in Indiana (1945). Contributed by Whiting-Robertsdale Historical Society. These databases are available to IGS members. 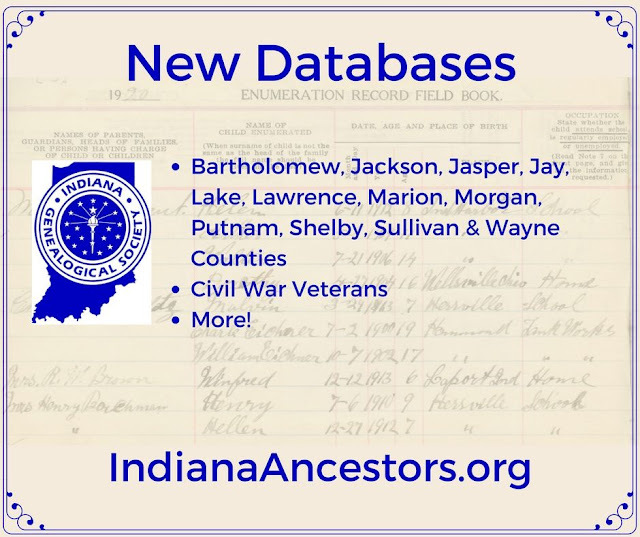 If you're not a member yet, sign up and get access to these and more than 2,000 other Indiana genealogy databases! - Index to Mortality Schedule for Jackson County (1860). Contributed by Meredith Thompson. - Graduates of Portland High School, Portland (1936). - Index to Mortality Schedule for Lawrence County (1860). Contributed by Meredith Thompson. - Alumni of Martinsville High School, Morgan County (1900-1913). Contributed by Meredith Thompson. - Graduates of Belle Union High School (1958). Contributed by Meredith Thompson. - Index to Mortality Schedule for Shelby County (1860). Contributed by Meredith Thompson. - Index to Mortality Schedule for Sullivan County (1860). Contributed by Meredith Thompson. Each of these was contributed by Sandy Thompson.